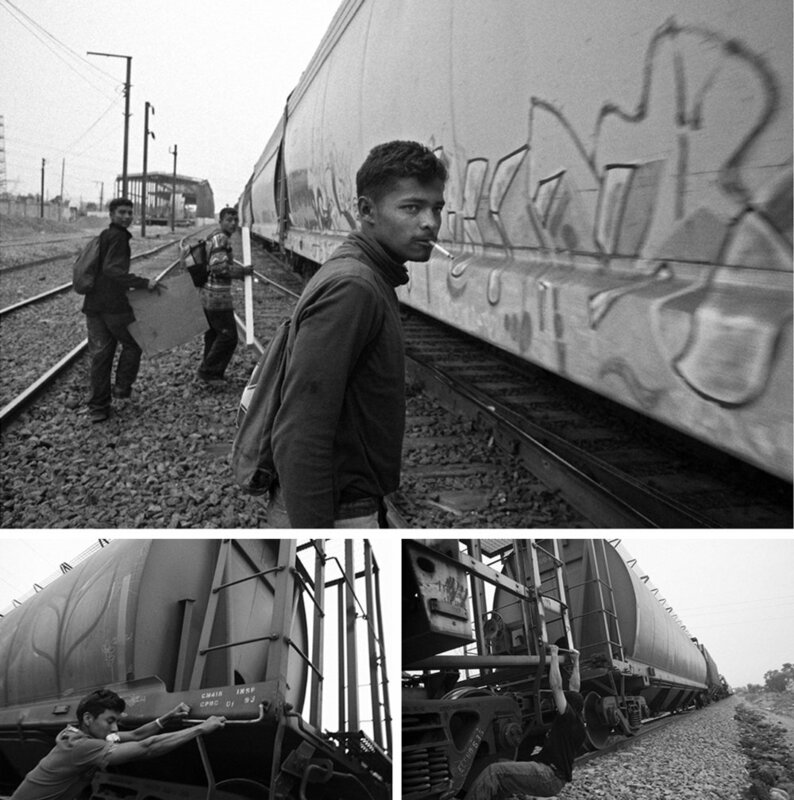 This is the first part in a series of photographs on migration. As much as it is about other places, it’s also about my country, The United States, and its relationship with those most in need, people this nation used to embrace but, as it applies to official policy, now shuns. Each morning around eight o’clock come the sounds of children and their parents walking to school just across the street from my apartment in Brooklyn. If I am in bed with eyes still closed I can tell time by the children’s chatter below: I hear shrieks of momentary discovery, boisterous conversation, laughter and sometimes crying that is accompanied by stomping feet and the complaining that comes from not wanting to sit behind a desk or wanting let go of the parental hand they are holding. After the stomping and crying, hands are separated with the trust that they will be joined again soon. This morning I woke to the daily morning scene and then started going through the newspaper headlines. Leading the news were the harrowing stories about how children are being separated from their families along the southern border of The United States. The most egregious story was written about an 8 month year old baby who stripped from its parents embrace and put in a cage by the Trump administration and its Republican enablers. The eight month old and its mother had made one of the most perilous journeys in the world to reach this county. After photographing the young mother to be the sun rose over the tracks, the day warmed. As I walked amongst the migrants I came across a young man who was hunched over on the tracks with a flattened cardboard box over his head. Possessions consisted of a toothbrush and a few things in a backpack. The last time he put toothpaste on the toothbrush was weeks before. So weakened, the young man who should have had an abundance of life in him was shivering in the sun. The town where I met these young parents and children, is called Lecheria. 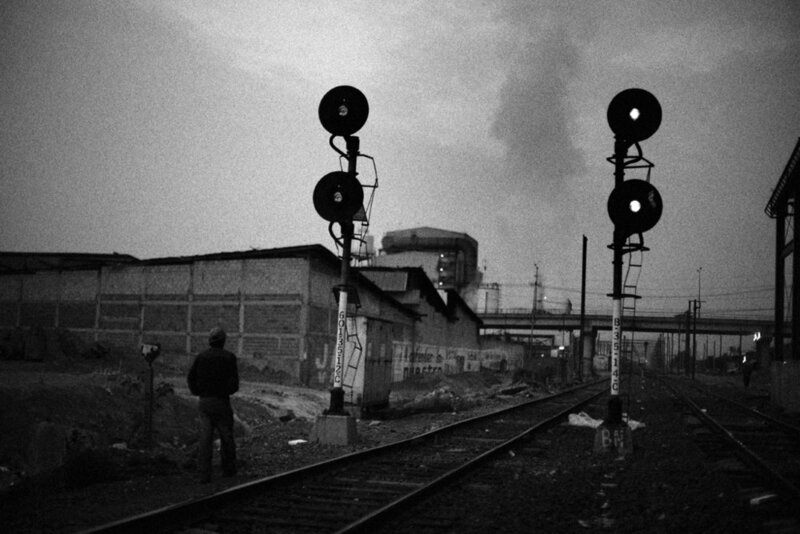 Lecheria is a dismal factory town on the outskirts of Mexico City. It serves as a crucial transit point for migrants who flee poverty and violence in their own countries. In Lecheria the tracks and lives diverge at which point the migrants will journey onto California, Arizona, New Mexico or Texas and hope to make it across. To reach Lecheria and ultimately The United States they ride what they call The Beast, freight trains that travel from Central America all the way to the United States. Along the way they get on The Beast by running alongside it as it leaves the depot and then get into the cars if they can or ride atop the cars if they can’t. As they try to latch onto The Beast some fall to their deaths and others have their arms and legs cut off if they make a wrong move. The journey is hardest for the younger migrants. Older people who have made the journey numerous times know what to expect and can make it through with meager possessions: a bar of soap, a toothbrush, a blanket or tarp, while the younger people usually are stripped of everything. 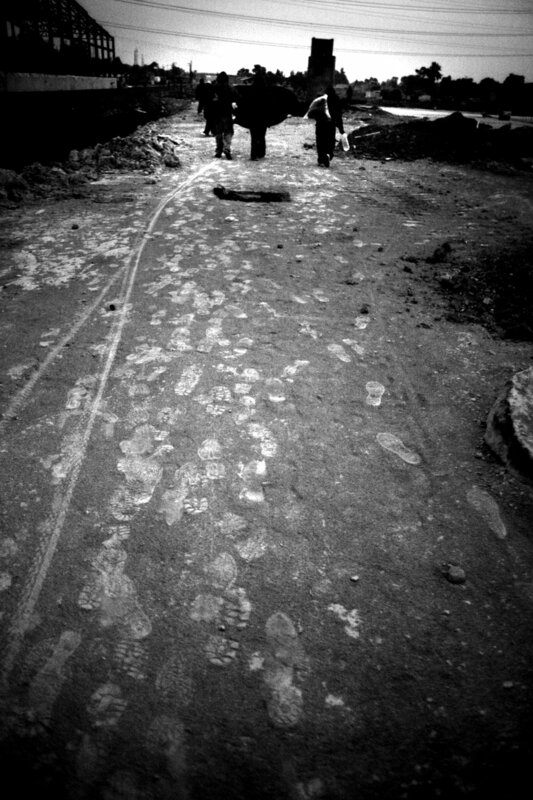 Before they reach Lecheria nearly all have been robbed, either by Mexican police, gangs or individuals who wait for them. 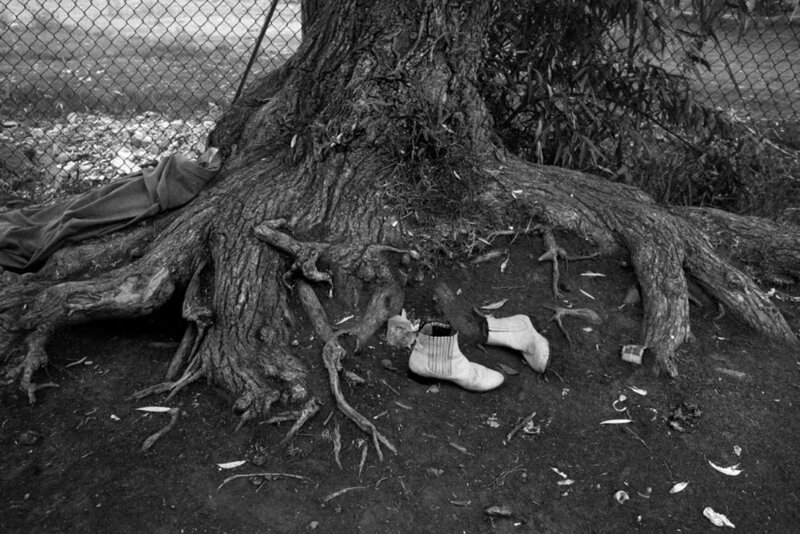 Worse, before reaching Lecheria, some have been killed and many of the women were raped and brutalized. It is a journey that nobody takes lightly or willingly. None would call it a caravan. Children who I interviewed said that just to leave their homes was risky because locals know they are setting out with money. These are not the actions undertaken by people who come to the United States merely to “take advantage of the system,” as so many who parrot and disseminate the press releases of the 45th President claim. Far from “a caravan” these are the actions of people fleeing for their lives, actions of those who would rather risk everything on The Beast than to continue to live amongst the dangers in their own country (dangers which the failed policy of The United States has its fair share of blame for). I asked the migrants I met, if they had the choice, would they leave their families and land behind? None wanted to leave. Instead they spoke of the pain they experienced when they left their mothers, fathers, brothers and sisters behind. They spoke of the vulnerability and loneliness they experienced once leaving the towns and villages and neighborhoods they knew all their lives. One of my colleagues who was with me that day gave her number to a man who eventually made it in the United States. He would call her intermittently from Chicago just to talk because he was so lonely. The sun has risen outside of my Brooklyn apartment. Across the street music is playing and I can hear the playful voices of children emanating from in the gymnasium, the squeaks of their feet on the hardwood floor matching their undeveloped voices. In a few hours the street will be full of children greeting their parents and care takers. Skittering down the street or walking hand in hand they will go back to loving homes with loving parents who care for them. A few thousand miles to the south equally loving parents and their children are cruelly separated from each other where they are put into cages within modern day internment camps. This separation is official policy of this country as implemented by the 45th President of The United States and the Republican Party who has enabled him to carry out these atrocities. Note: after writing this article the 45th president has rescinded the order to separate children from their families and removed them from their cages. He now cages the children with their entire families together. In total more than 3,000 children are still separated from their parents and it's unsure how they will ever be reunited. A note on this series: Shivering in the Sun is in reaction to the systematic cruelty and apathy that has engulfed so much of The United States and the rebirth of fascism in Europe, euphemistically called right wing populism. I believe that Europe and the United States are better than what we currently are and are counter to the principles of enlightenment. The only way to push back against less enlightened policy is to promote, support and strengthen enlightened policy and institutions. I grew up in an imperfect nation, but one from which good things also came, although not nearly as many good things as we were capable of. As it applies to the current president and his party, what good comes from the United States now? What good comes from implementing internment camps and having babies taken from their mothers? What good comes from a nation that want to spend billions for concrete walls that separate nations but has its school and hospital walls crumble from within? What good comes from a nation that calls other nations shitholes, sees nothing of their people and their capability and shits on alliances amongst friends that have been nurtured and invested in since World War II? As it applies to all who are against the policies of the president and his party what good comes from those who oppose him and constantly protest but do not turn out to vote?